iTapuih.com - Soal Bahasa Inggris Persiapan UN SMP 2016. Pada pertemuan kali ini saya akan berbagi kumpulan soal-soal Bahasa Inggris sebagai pesiapan UN. Ujian Nasional biasa disingkat UN / UNAS adalah sistem evaluasi standar pendidikan dasar dan menengah secara nasional dan persamaan mutu tingkat pendidikan antar daerah yang dilakukan oleh Pusat Penilaian Pendidikan. Sebagai usaha persiapan menjelang Ujian Nasional, saya telah menyedikan beberapa soal untuk adek-adek yang sedang melaksanakan UN. Soal Bahasa Inggris Persiapan UN SMP 2016 (Part 2) dan Soal Bahasa Inggris Persiapan UN SMP 2016 (Part 3) bisa anda klik pada tombol paling bawah. Once upon a time there were four little rabbits. Their names were Flopsy, Mopsy, Cotton-tail and Peter. One morning they were allowed to play outside. Their mother reminded them not to go to Mr. McGregor’s garden because their father had an accident there. Flopsy, Mopsy, and Cotton-tail were good little rabbits. They went down the lane to pick blackberries. But Peter was naughty. He ran straight away to Mr. McGregor’s garden. He ate some lettuces, French beans, and radishes. Suddenly, he met Mr. McGregor. Peter was very frightened and rushed away as fast as he could. He lost a pair of shoes and a jacket while he was running. Peter never stopped running or looked behind him till he got home. During the evening, he was sick because he was so tired. He had to drink some medicine while three of his brother had bread, milk and blackberries for supper. 1. Who was the naughtiest rabbit ? 2. What did Flopsy, Mopsy and Cotton-tail eat? 3. What did Peter lose while he was running? 4. Why did Peter get sick? Because …. 5. Whom did Peter meet at the garden? In the framework of National Education Day the Students Organization will hold some interesting programs. They are English Speech Contest and Class Wall Magazine Competition. The program will be held on June 2nd, 2016. Started from 8 a.m until 1 p.m.
All classes must take part in the programs. 6.What is the announcement above about? 7. Based on the announcement above, these statements are correct, except …. This weekend was a disaster for James. On Saturday, he met a friend in the city centre to have a coffee at a cafe. James ordered an espresso and his friend asked for a cappuccino. They talked about what they wanted to do on Saturday evening. James said to his friend that he wanted to go to a new cafe called the Jomblo Cafe and James' friend Harry agreed with him. Harry told James that he would call two girls he knew to invite them too, paid for the coffees and they left the bar together. So, at 9pm James went to the cafe and waited for his friends. after half an hour, he was worried about his friends. Lots of people arrived at the new cafe, but not his friend Harry or the girls he knew. So James took out his cell phone and wrote a message to Harry. "Where are you? I am waiting for you! I am in front of the cafe." After two minutes, Harry replied to James: "We are opposite the cafe, but we can't see you." James wrote back: "OK, we will find each other after a few minutes. Do you think the cafe looks nice?" "Yes," replied Harry, "but isn't the Jomblo a strange name for a cafe." 8. Who did drink coffees in the cafe? 9. Where does the story take place? 10. ".... worried about his friends." 11. ".... Jomblo a strange name for a cafe." What is the similar meaning of the underlined word? Hello Jesica, how are you? It’s been a month since I last heard from you. Well, I just wanted to tell you that I was in a hospital last week. According to the doctor; I was infected by dengue fever. At first, I felt my body became weak then I fainted when I was studying in the classroom. Then, I was taken to the hospital because of the high fever. At the hospital, I was brought into the emergency unit. The doctor immediately gave some treatment. Finally, I had to stay there for one week. Everyday the doctor kept me on a drip. At the seventh day, my condition was getting better. After the final check, the doctor gave me permission to go home. Now, I’m okay and because of my illness, I am now more careful about keeping in my house clean especially my room, I don’t want to get the same illness again. OK, I think that’s all from me, write to me soon ok? 13. What did the writer do she felt her body became weak? 14. Why the writer was taken to the hospital? 15. How long she was taken care in the hospital? 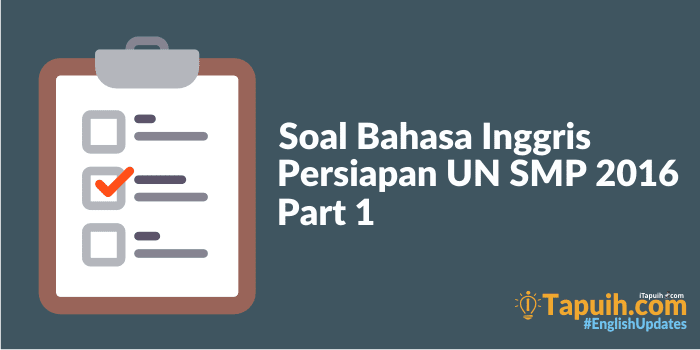 Demikianlah artikel tentang "Soal Bahasa Inggris Persiapan UN SMP 2016 (Part 1)". Klik tombol Lihat Kunci Jawaban untuk melihat kunci jawabannya.